This 14 day tour starts in Mexico City for a glimpse into the modern, yet history-rich capital of Mexico before traveling up to the ‘cradle of the Mexican Independence’ movement in Guanajuato, immersing you in the colorful and colonial side of the country. Making your way towards the Pacific Coast, you will stop in Guadalajara to discover the folklore and traditions behind the Mexican symbols of mariachi and tequila. After traveling the state of Jalisco, including time at Lake Chapala, you will make your way to Punta Mita on Mexico’s Pacific Coast, where you can enjoy nights chasing down all the fun available in the area or simply taking in the vistas on the Riviera Nayarit. Arrive Mexico City 2 Nights > Drive San Miguel de Allende 3 Nights > Drive Lagos de Moreno 1 Night > Drive Guadalajara 3 Nights > Drive Punta Mita 4 Nights & Leave. Overnight Stay at the Hotel in Mexico City. You will be picked up in the morning at the hotel lobby for a full day, privately guided tour (6-8 hours) of the National Anthropology Museum and Mexico’s Historic City Center. At the museum your expert guide will add contour and color to the myriad of exhibits with special attention on the Aztec and Maya rooms. You will continue on to the Historic Center with visits to the Zocalo flanked by Mexico’s most important and buildings including: The National Palace, The Metropolitan Cathedral, a look from above into the Temple Mayor Aztec Archaeological Site, the Palace of Fine Arts and more depending on time and interest. This great square, called the Zocalo, evokes the place of homage and center of the world which was the heart of the ceremonial nucleus of Mexico-Tenochtitlan. Time for lunch will be provided today (can be included at additional cost) at one of the many fine eateries in the capital of one of the world’s great culinary countries. After an early breakfast, meet your expert driver-guide in the hotel lobby and head northwards to Teotihuacan, one of the most famous archaeological sites in Mexico. As you explore the site, learn about Teotihuacan’s accomplishments; the Temples of the Sun and Moon and other important structures shed light on the life and times of these powerful inhabitants of Mexico’s oldest and most important permanent settlement. After lunch in a local restaurant the journey will continue towards San Miguel de Allende, at arrival you will check in at your charming hotel and rest of evening at leisure. Overnight Stay at the Hotel in San Miguel de Allende. Today after breakfast you will meet your guide at the hotel lobby for a private walking tour of San Miguel De Allende (an UNESCO World Heritage Site). Visit the colourful and art-filled city center to include visits to the most important sites such as the famous Parroquita de San Miguel Arcángel designed by the indigenous stonemason Zeferino Gutierrez from a postcard depicting a Belgian Church! The history and lore of San Miguel are intertwined with Mexico´s Independence Movement, and the energy and spirit of freedom of expression have continued on in the lively creative enclave of modern day San Miguel. Early this evening you are invited to experience a tequila tasting in Casa Dragones, home to one of the finest, premium tequila brands of Mexico. Visit the historic the 17th century Casa Dragones house (otherwise closed to the public) attending to a private tequila presentation and degustation to discover the unique qualities of this limited edition, hand crafted Tequila. You will meet your guide in the lobby for a full-day excursion to the creative center of Guanajuato, approximately 1:20hr away by private vehicle. The city’s history is as rich as its mines were full of silver during the Colonial Era. With your expert guide, you will enjoy a walking tour of the historic landmarks of the city center and use the morning to orient yourself to the winding streets and subterranean passages that make this city a Mexican medina! The thriving down town is full of interesting shops, and the smells of delicious local fare wafts through the streets inviting you in to the many delicious eateries. Meet your private transfer to Lagos de Moreno, at arrival settle into your beautiful hacienda and enjoy rest of the day on property. Hacienda Sepulveda has been restored to serve like a luxurious boutique hotel. All activities, the nice weather, the beautiful landscapes and the historical background of the hacienda will charm you. You will be met by your guide in the hotel lobby for a private transfer to Guadalajara to enjoy a city tour. You will take in some of this colonial city’s most treasured sights including the Palacio de Gobierno, Hospicio Las Cabanas Cultures, Plaza Tapatia, the ArchesMonument, Minerva Fountain, Republic Square, Heroic Boys Monument, Metropolitan Cathedral, and many other beautiful sites. Guadalajara is much more than just a city, it is one of the best representation of life in México. The “City of the Roses” is known for its beauty, and is the second largest metropolis of the Republic, exceeding 190 square kilometers and inhabited by a population of over four million. Today you will meet your guide at the hotel lobby for your privately guided excursion to Tonalá where you will sense the flavor or Mexico learning about the culture and artisans work. 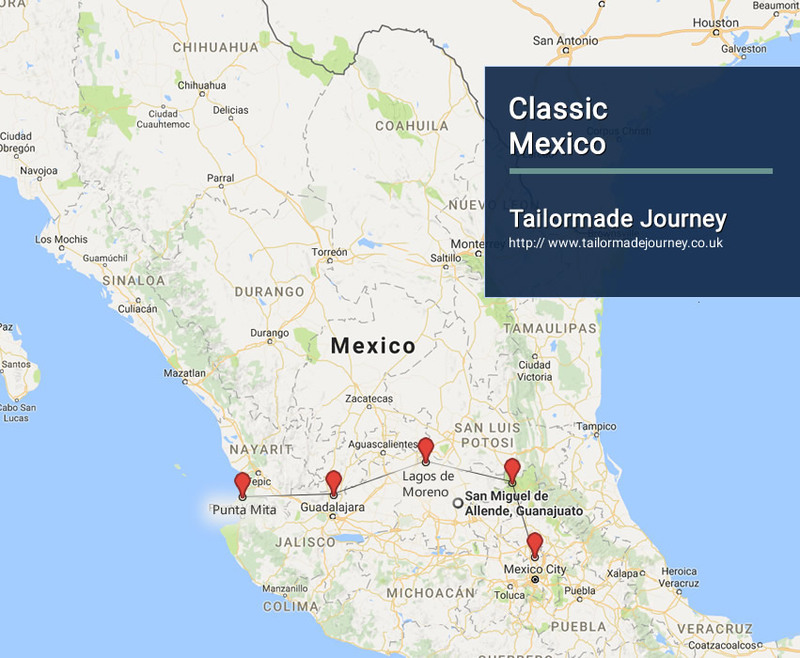 We will continue towards Tlaquepaque, here you will find a wide variety of handicrafts, enjoy typical Mexican dishes and of course the world famous Tequila accompanied by Mariachi music. Overnight Stay at the Hotel in Guadalajara. You will be met by your guide in the hotel lobby for a full day private tour to near by Chapala Lake, including the pleasant lakeside towns of Chula Vista and Ajijic. Since the 1950’s, Ajijic has been considered the artistic centre of the Chapala Riviera. Its artistic colony is comprised of both Mexicans and non-Mexicans, working in a variety of media. Almost always there are several current exhibitions open to the public either in local galleries and stores, or in the hotels and restaurants. Chapala is located 28 miles (45 km) south-southeast of Guadalajara, on the north shore of Lake Chapala, Mexico’s largest freshwater lake. Since the 1960s, Chapala has been frequented by both Mexican and international tourists. Among the area’s cultural attractions is mariachi music, for which the state of Jalisco is particularly known. Today after breakfast your guide will be waiting for you at the hotel lobby at for a full day tour of the Mexican Magic Town of Tequila, including a tour to one of its famous distilleries to learn how this tasty and powerful elixir is made from local agave plants. After the town of Tequila, we head for the Pacific Coast to Punta Mita, where you will settle into your luxury resort. Overnight Stay at the Hotel in Punta Mita. A picturesque fishing village nestled on Mexico’s Riviera Nayarit, Punta Mita is an oasis of white-sand beaches and turquoise waters that boasts some of the best snorkeling scuba diving, fishing, surfing and golf in the world. Today enjoy a privately guided tour of Puerto Vallarta and visit the most important areas in Marina Vallarta, the downtown area, mountains, and the most important sightseeing followed by a delicious lunch in a beautiful ocean front Restaurant in the romantic zone. You will also have time to visit galleries and shopping areas. Puerto Vallarta has long-served as an unhurried refuge for people seeking more than just a beautiful beach. The sun-drenched colonial seaside town is both dramatic in setting and diverse in its appeal. The signature swim with dolphinsadenture offers the smallest group size available anywhere. You’re ensured the best possible opportunity to develop a close personal bond with your dolphin and you’ll discover all there is know about dolphins from the best possible teachers – the dolphins themselves, as they talk and flirt with you in the comfort and safety of our specially designed pool. Transferred to Puerto Vallarta Airport to board flight for onward Journey.